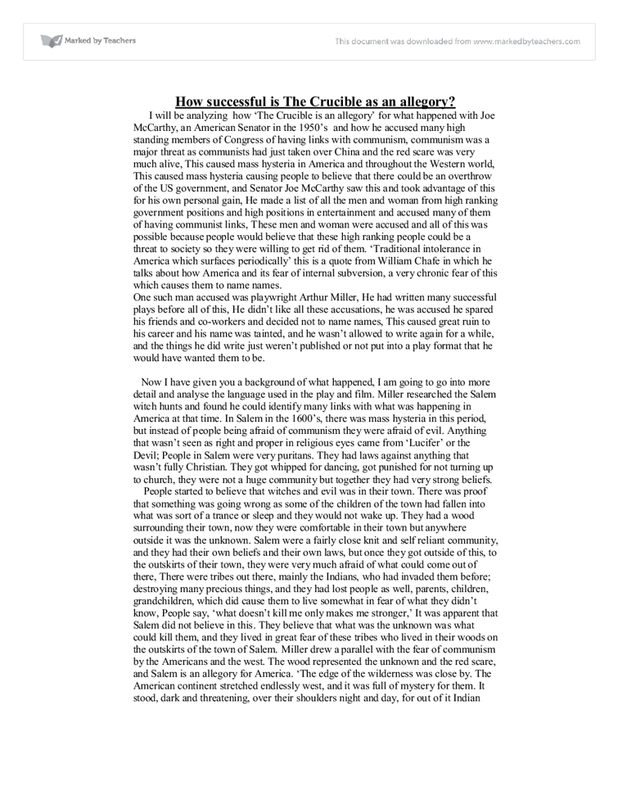 I will be analyzing how ‘The Crucible is an allegory’ for what happened with Joe McCarthy, an American Senator in the 1950’s and how he accused many high standing members of Congress of having links with communism, communism was a major threat as communists had just taken over China and the red scare was very much alive, This caused mass hysteria in America and throughout the Western world, This caused mass hysteria causing people to believe that there could be an overthrow of the US government, and Senator Joe McCarthy saw this and took advantage of this for his own personal gain, He made a list of all the men and woman from high ranking government positions and high positions in entertainment and accused many of them of having communist links, These men and woman were accused and all of this was possible because people would believe that these high ranking people could be a threat to society so they were willing to get rid of them. ‘Traditional intolerance in America which surfaces periodically’ this is a quote from William Chafe in which he talks about how America and its fear of internal subversion, a very chronic fear of this which causes them to name names. One such man accused was playwright Arthur Miller, He had written many successful plays before all of this, He didn’t like all these accusations, he was accused he spared his friends and co-workers and decided not to name names, This caused great ruin to his career and his name was tainted, and he wasn’t allowed to write again for a while, and the things he did write just weren’t published or not put into a play format that he would have wanted them to be. 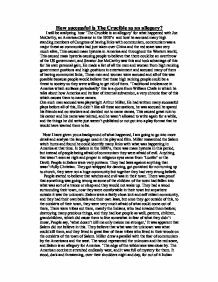 Now I have given you a background of what happened, I am going to go into more detail and analyse the language used in the play and film. Miller researched the Salem witch hunts and found he could identify many links with what was happening in America at that time. In Salem in the 1600’s, there was mass hysteria in this period, but instead of people being afraid of communism they were afraid of evil. Anything that wasn’t seen as right and proper in religious eyes came from ‘Lucifer’ or the Devil; People in Salem were very puritans. They had laws against anything that wasn’t fully Christian. They got whipped for dancing, got punished for not turning up to church, they were not a huge community but together they had very strong beliefs. People started to believe that witches and evil was in their town. There was proof that something was going wrong as some of the children of the town had fallen into what was sort of a trance or sleep and they would not wake up. They had a wood surrounding their town, now they were comfortable in their town but anywhere outside it was the unknown. Salem were a fairly close knit and self reliant community, and they had their own beliefs and their own laws, but once they got outside of this, to the outskirts of their town, they were very much afraid of what could come out of there, There were tribes out there, mainly the Indians, who had invaded them before; destroying many precious things, and they had lost people as well, parents, children, grandchildren, which did cause them to live somewhat in fear of what they didn’t know, People say, ‘what doesn’t kill me only makes me stronger,’ It was apparent that Salem did not believe in this. They believe that what was the unknown was what could kill them, and they lived in great fear of these tribes who lived in their woods on the outskirts of the town of Salem. Miller drew a parallel with the fear of communism by the Americans and the west. The wood represented the unknown and the red scare, and Salem is an allegory for America. ‘The edge of the wilderness was close by. The American continent stretched endlessly west, and it was full of mystery for them. It stood, dark and threatening, over their shoulders night and day, for out of it Indian tribes marauded from time to time, and Reverend Parris had parishioners who had lost relatives to these heathen.’ In this passage Miller uses personification to make the wilderness sound more real and evil as if it were a real person. ‘The Salem folk believed that the virgin forest was the Devil’s last preserve, his home base and the citadel of his final stand.’ Here he uses repetition and personification to show how this is the devil, as if he is a real person and really could bring suffering and how evil could be lurking round every corner, as he was only just outside their town. In Salem when everyone started accusing one another and this was the same in America, ‘traditional intolerance in America which surfaces periodically’ this Is saying how every once in a while this kind of blame in an era of some sort comes out and shifting the blame of your back or ‘passing the buck’ does happen and more and more frequently. And when people started being accused other people were worried about themselves in case they get accused possibly by an enemy of some kind or some form of grudge, whether it be personal or just simply being there or an old family rivalry, and people began to worry quite a bit about themselves and what would happen to them; that they would get called up, In America this was exactly the same, as to nominate someone you could save yourself. So if you saw someone up in front of the house un-American activities and you knew them and you had a grudge against them or vica versa you could be in real trouble because they can quite easily ‘drop you in it,’ by just saying your name. This is illustrated in The Crucible when Reverend Parris says ‘my enemies, do you understand that I have many enemies?’, This is a good example of repetition where Parris is stressing that he has many enemies and that he is worried about himself that someone could name him as a Devil dealer, He is saying this because he hasn’t been in Salem very long and he isn’t very well loved by everyone then, and also because he has shown himself as a materialist. In both Salem and America suspicion was rife. Everyone had ideas on who was either communist or a witch, friends suspected friends, family suspected family and spouses suspected spouses, ‘Still an everlasting funeral marches round your heart. I cannot speak but I am doubted, every moment judged for lies, as though I come into a court when I come into this house!’ Here Proctor says to Elizabeth that an air of suspicion from her is always looming round his head and how he cannot do anything without him being judged. Miller uses a simile and more personification to say how the funeral marches, because of course a funeral cannot march. It is an inanimate object, and he is comparing her to a court with the simile, this works because when you enter a court you are immediately judged as you go in or by what you say or how you act, this is exactly the same as Elizabeth according to Proctor as whenever he does something he is judged straight away. This kind of suspicion and blame tore people apart, and death wasn’t even needed to do this anymore! ‘Suspicion kissed you when I did; I never knew how I should say my love. It were a cold house I kept.’ Here he uses personification to show how suspicion kissed him when Elizabeth did, and also about her coldness emotionally and not being able to express how she feels, implying it as more of a real feeling around them than just a word you can use, as the result of his sayings. Even though there was a lot of suspicion and deceit amongst characters, there still was love between them, especially between Proctor and Elizabeth. ‘I will bring your guts into your mouth but that goodness will not die for me.’ Here he expresses his love for Elizabeth by using Elizabeth as the goodness and saying he will not let her die for someone else’s talking. Miller uses characters in this play as example of the characters in real life in America. He uses Abigail Williams to represent Joe McCarthy. ‘Where she walks the crowd will part like the sea of Israel.’ This is showing how where Abigail walks the crowd will part and let her walk through as if she if is a god-like figure or some kind of religious entity. ‘The girl is murder! She must be ripped out of the world!’ This emphasises how she is not loved by everyone and that she should be taken out of there, but not in a nice way. By saying she must be ‘ripped’ out, he implies a violent taking as if he would want to kill Abigail and get rid of her for ever and she has seen through Abigail and recognises what drives Abigail. A comparison can be made between Miller and Proctor; ‘Because it is my name! Because I cannot have another in my life! Because I lie and I give myself to lies! Because I am not worth the dust on the feet of those who hang! How may I live without my name! I haven given you my soul; leave me my name! Here Miller uses a lot of repetition to emphasise the importance of a name, because if his name is tainted his children will be brought into a world where there names will be forever scarred. This will happen if he confesses to being a witch and having made a pact with the devil. In the USA at the time this was the same as being brought in front of the house un-American activities committee. This is also the case with Arthur Miller, who would prefer not to name names and keep his dignity, even though his name would be tainted. And this did have huge consequences on him because a lot of his work wasn’t allowed to be performed because of this accused links with communism. So Arthur Miller uses this character as a spokesman of his own beliefs about these but uses the book of The Crucible as an allegory for what happened in the USA during the ‘red scare’ and uses his beliefs in this world In The Crucible by using hidden undertones in it. Arthur Miller has made some minor credible changes in certain aspects to the play such as ages of the characters. Originally Abigail Williams was at the young age of just eleven or twelve and John Proctor was around 65 years of age. The scene here is obviously naturalistic. Whilst she lays there she maintains an unnatural and distorted body position; much like the supposed goings on in Salem. There is then a shot/reverse shot sequence of Hale and Tituba during which Hale interrogates her about the satanic contingency in Salem.